I used to be on the receiving end of teacher gifts, but now with Firecracker in school for the first time, we needed to come up with some. Scholastic posted something on Facebook a week or two ago asking teachers to respond with the favorite gift they'd ever received. 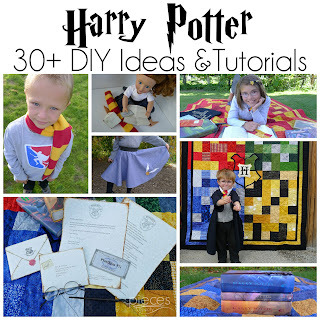 I browsed through them for some ideas. Here's what we ended up with inside them, and I estimate they cost about a dollar to put together. 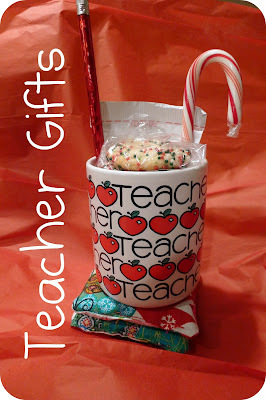 Rice bag hand warmers, hot chocolate mug, hot chocolate packet, 6 or 7 homemade cookies, candy cane, pencil, homemade fingerprint card (I'll show you those soon), and last but definitely not least...a copy of a letter we wrote telling the principal what a great job Firecracker's teacher and #1 classroom aid are doing. I got the mugs from the thrift store for 50 cents. 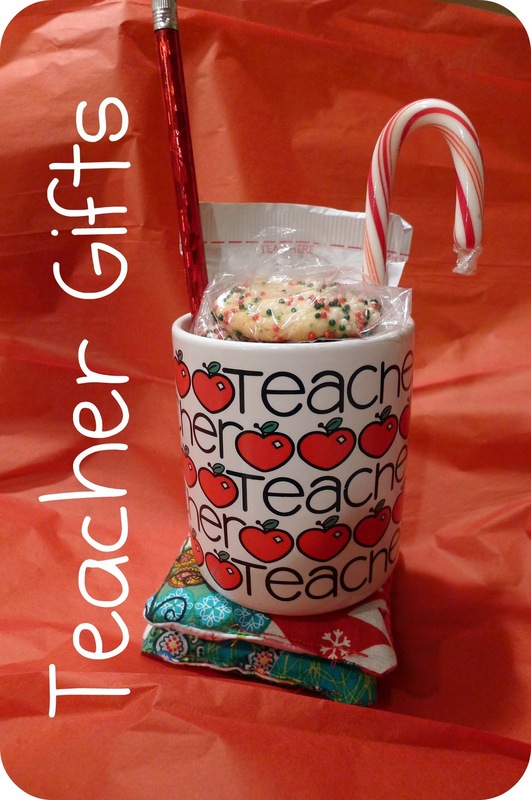 You will have to search to find ones that are really cute and are in like new condition, but we found this cute teacher one, and some Sandra Boynton mugs for the aids who help in the classroom. 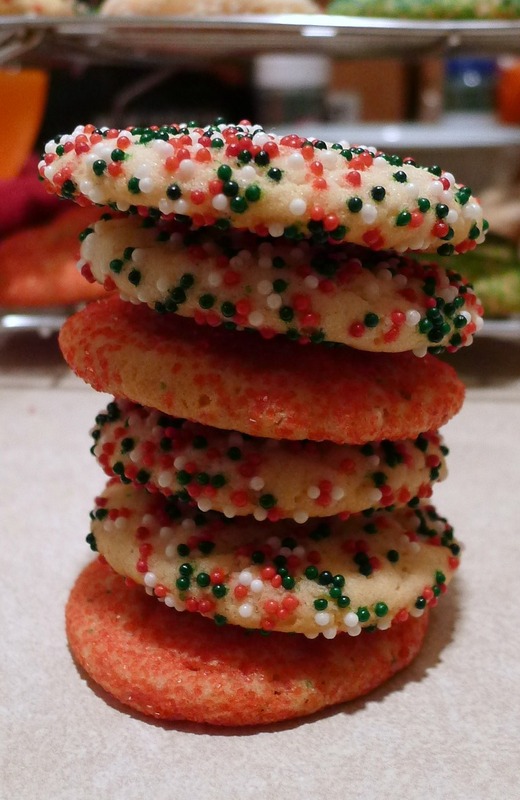 Firecracker stacked the cookies up in a pattern. They've been doing a lot with patterns in her class. She did different patterns for different people, but here is her ABB pattern. The Christmas pencils came in a 12 pack from the dollar store. The candy canes were 12 for 88 cents at Wal-Mart. Firecracker did most of the work on the handwarmers herself...with close supervision. 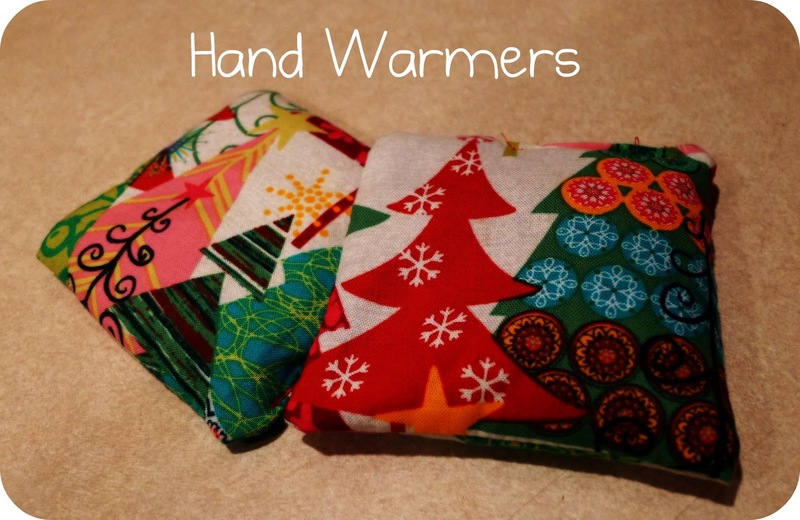 We came up with the hand warmers because it was something Firecracker could help make. It's pretty cold here, so we thought her teacher and aids might like them to keep their hands warm at recess. They're little rice/wheat bags that you heat up in the microwave. (Firecracker's teacher has a microwave in her room she can use.) And if the teacher doesn't really want to use them as hand warmers, they can double as bean bags for different games. Firecracker helped choose the fabric. 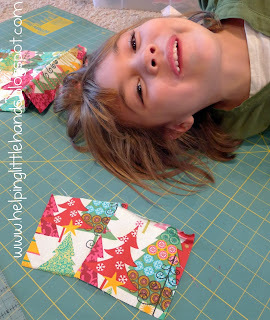 (A big thank you to Natalie for sharing her cute, trendy Christmas scraps!) 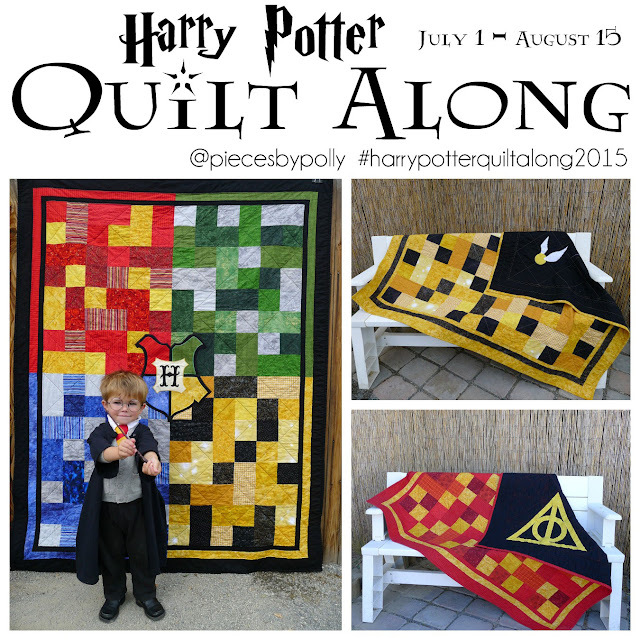 We cut them into 4 1/2 inch squares. 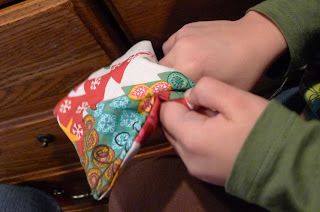 Then Firecracker helped sew them. She worked the foot AND guided the fabric through by herself for the first time. 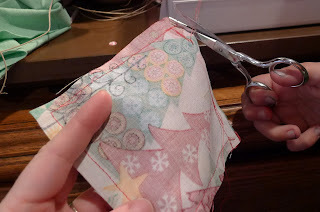 Sew around all the edges, leaving a little hole in one side. 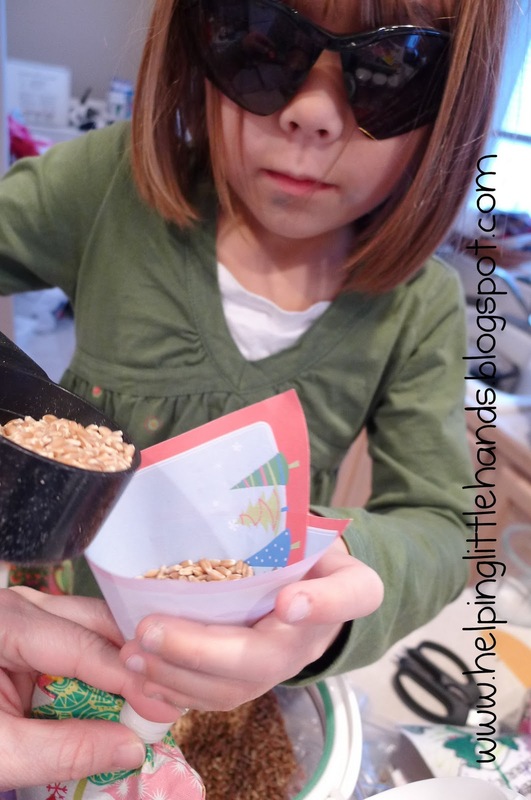 Fill with rice or wheat kernals and sew the opening shut. After trying these out ourselves, we found that putting a pair in the microwave for about 30 seconds seemed right...and now Firecracker wants to make some hand warmers for herself. 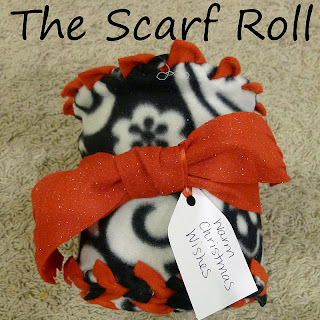 ...or here to see the scarf roll filled with warm goodies. 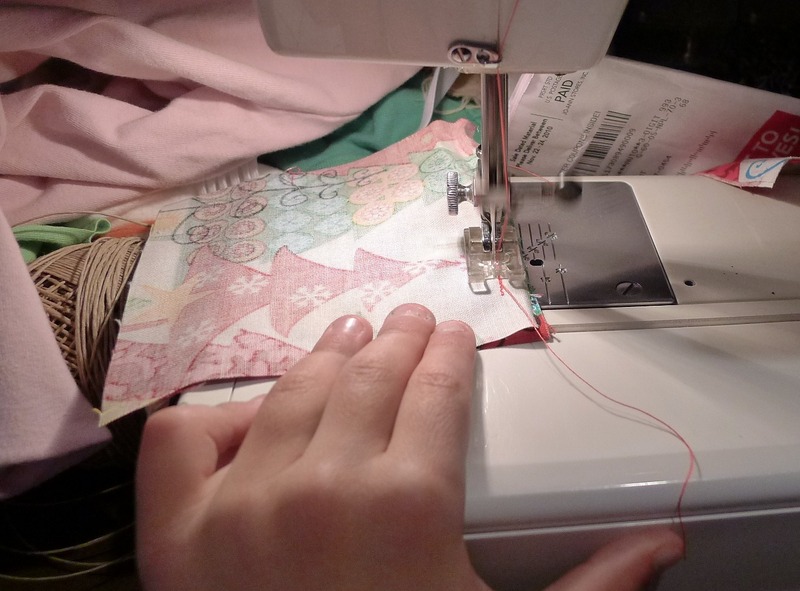 You were about that age when you began using the sewing machine. Good for Firecracker!